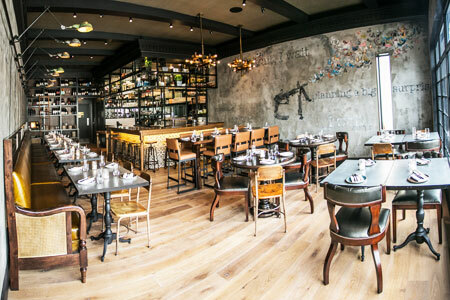 Southeast Asian cuisine in a casual setting in downtown Manhattan Beach. 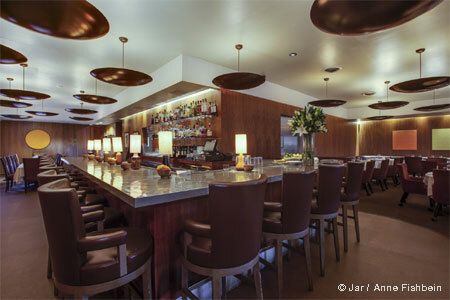 : The Manhattan Beach dining scene has been heating up recently with trendy restaurants. Among these is Little Sister, a project from co-owners Jed Sanford and chef Tin Vuong (Abigaile). Although little in size and in name, the restaurant is big in character and ambience. Be prepared for high decibels as the room can get very noisy. A long banquette lines one wall of the space, which also encompasses a handful of tables, a communal table that can seat up to nine guests, and a counter where patrons can observe some of the food prep. Chef Vuong takes taste buds on a Southeast Asian culinary journey based on Cantonese cuisine with Vietnamese accents. Skip around the various menu headings: “Introductions” (beef tartare with pear, pine nuts, quail egg and bone marrow vin), “Rice Paper” (grilled pork spring rolls), “Fish and Shellfish” (quick-fried scallops with mango chutney in a Malaysian yellow curry sauce), “Meat and Poultry” (crispy flatbread filled with chili lamb), “Noodles and Rice” (Saigon lemongrass beef, vermicelli noodles, herbs, cucumbers and chili-lime dressing) and “Eastside 626 Provisions” (ma la pickles with Szechuan peppercorns). The wine list favors California selections, and there are also several sakés. About a dozen interesting beers are on tap, including Abigaile’s house-brewed beers such as the Sir Charles Mild ale. Little Sister may not be a temple of gastronomy, but it is a fun place that we hope will continue to please our palate for years to come.